I have no idea how many sermons I’ve given, but by now I have a pretty good idea of those themes I like to tackle and the ones I won’t touch with a ten-foot pole. In the latter category I put famines, wherever in the world they might be. It’s not that I lack empathy, because I don’t. However, most congregations I preach to in central Minnesota are singularly ill-equipped to plunk down money for an expensive ticket to Nairobi, solve the hunger problem there, and be back by the end of the week. The same holds true for peace in the Middle East or Afghanistan. Most monks I know — and I’m in that category — wouldn’t know where to begin, even if the abbot gave us permission. So for that reason I prefer not to preach about things ordinary people can’t do much about anyway. All it does is make some people feel guilty because they can’t do anything to help; while others feel depressed because they can’t do anything to help. It’s better to preach about things that people can actually do, rather than harangue them about things they can’t. So it was that the words of Pope Francis on New Year’s Day were a delight to me. Instead of pie-in-the-sky civilization-changing deeds, the pope spoke about stuff that almost anybody can do to make the world a better place. Specifically, he spoke about driving a car. Driving can set the tone for the health of a community, and whether people are considerate when they’re behind the wheel or whether they’re hell on wheels does matter. Ask your typical Romans trying to get across the street, and they’ll tell you so. Driving is something that touches nearly all of us. Many drivers are thoughtful and generous. Some should be locked up. Still others shouldn’t be behind the wheel in the first place. Regardless of where we fit on the chart, time spent at the wheel gives us the chance to have at least some impact on our neighbors. For better as well as for worse, every time we get behind the wheel we can make or ruin someone’s day. It really is that simple. Pope Francis didn’t mean to single out driving as the toughest challenge facing the world. Anyone who’s read even a few of his sermons knows that he hammers away at war and hunger too. But driving is a convenient example of how we can make a difference in the lives of others, virtually anywhere and at any time. I thought the pope’s comments provided good fodder for those of us wondering what we might do to make the world a better place in 2018. The good news is that we don’t have to fly 6,000 miles to accomplish something worthwhile. Someday there may be the chance for that, but for now the really great news is that there’s plenty to do near at hand. We need only open our eyes and see who’s standing in front of us. There is our opportunity. There stands Christ. I can’t help but think about the streets of Rome and what a harrowing experience it can be to cross them. It’s a bit like what wildebeest confront when crossing a river full of crocodiles. So I’m left wondering whether Pope Francis inadvertently got his listeners all stirred up on New Year’s Day in Saint Peter’s Square. Just behind them roared a maelstrom of traffic, which each had to cross. I’m guessing that more than a few prayed that the drivers of Rome were listening to the pope on the radio. That’s when they — and we — begin to appreciate how important are the so-called little things in life. They’re far more important than we might think, because in them we encounter the chance to do the serious work of the Lord. Even in the traffic we find the presence of God. +New Year’s Day came and went quietly in the monastery. +On January 2nd I flew to New York for a series of visits with alumni of Saint John’s. It was not the best week to be there, and the national news was not reticent about reporting it. It was bitterly cold, and the big snow day saw the city grind to a halt. I was surprised to note that the cars ground the fallen snow into the consistency of mashed potatoes, and it was really slippery. +The storm gave me some time out to visit two of my favorite places in the world — the Metropolitan Museum of Art and The Morgan Library & Museum. I last visited The Morgan when a dear friend of Saint John’s presented an Apostles Edition of The Saint John’s Bible to The Morgan’s permanent collection. +The first three photos in today’s post show items now housed at the Metropolitan Museum of Art in New York. 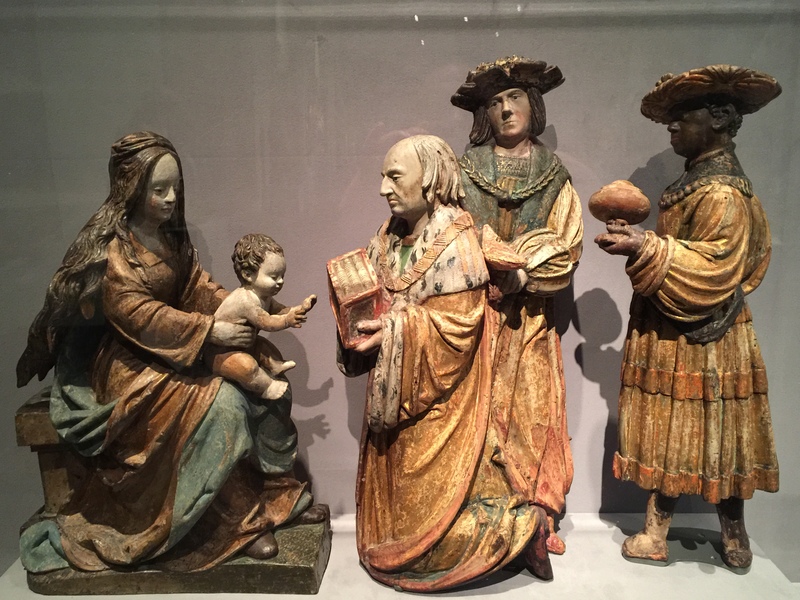 At top is a limewood sculpture of the Adoration of the Magi, made in Swabia in Germany, ca. 1515-20. 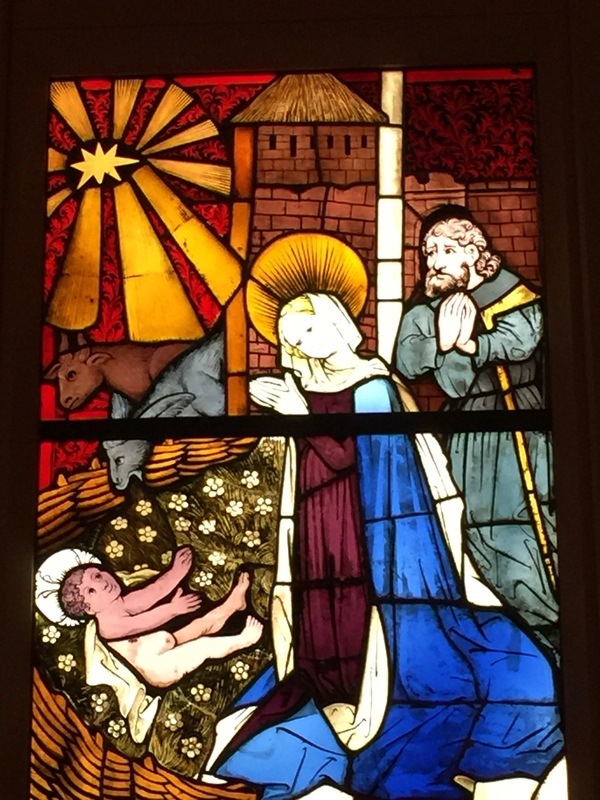 Next is a stained glass of the Nativity, made in 1444 for a church in Boppard-am-Rhein in Germany. 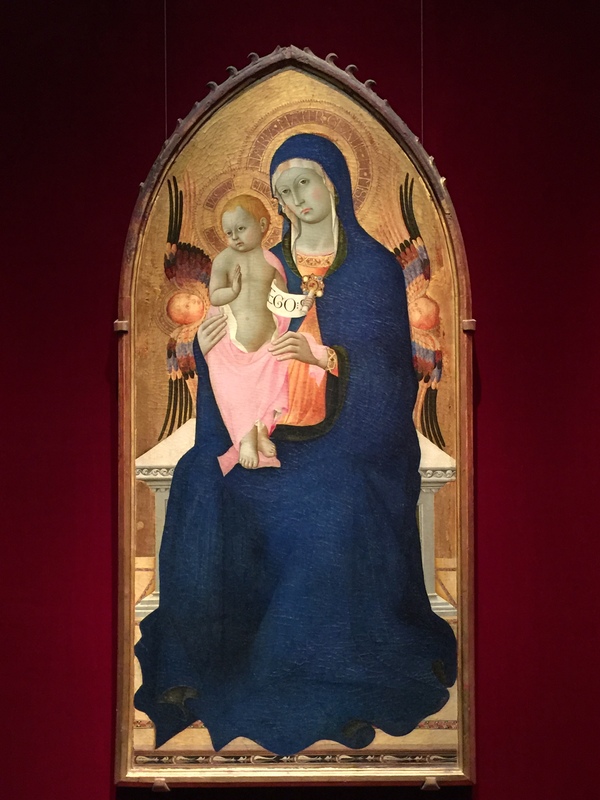 Next is a Madonna and Child, made in Siena ca. 1440. 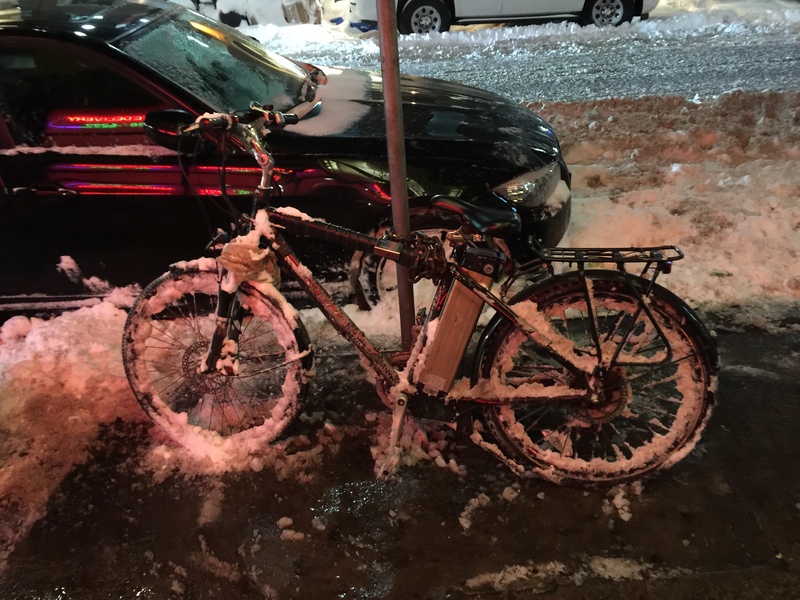 At bottom is a bicycle I saw in New York. It was actually worse than it looks, and I can only pray that the drivers were kind and merciful to this poor cyclist.